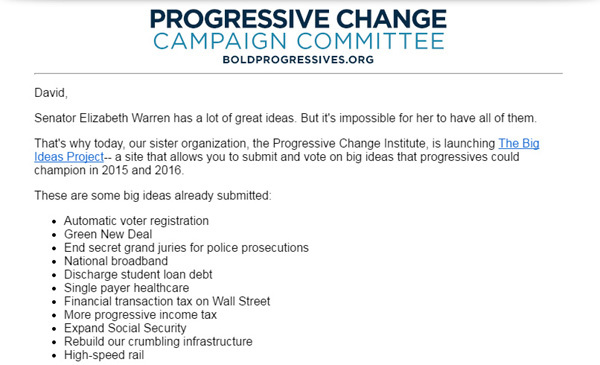 The Progressive Change Campaign Committee recently launched The Big Ideas project. At this site, people like you and me can submit ideas we have for a better country. It’s a great idea. The trouble I have is that I want all of these things. I don’t just want to focus on one or two. I want major change. So I asked myself the question: What’s holding us back from major change? I believe the biggest thing that’s holding us back from doing these things is a corporate special interest group idea. It’s the idea that government should serve the interests of corporations and this will, in turn, be good for everyone. I know, crazy right? But a lot of people have bought into this notion because it has been sold to us as “freedom” in the form of smaller government. The corporate special interest marketing and educational campaign has been so successful, in fact, that it dominates public discussion and opinion to the point where I don’t think we’re going to get anything on the PCCC’s wonderful big ideas list until we can convince more people that there’s a better way. That is, the proposals on the big idea list make sense to us because we believe in a different definition of our country. We believe our country is a democracy that should start with people and we believe freedom is about opportunity and shared prosperity. All the policies at the big ideas site make sense to us because of these beliefs. The problem is they don’t and won’t make sense to many, many people unless we first revive ideas about democracy. This is why my big idea is about how to revive democracy and make possible more of the policy ideas on the big ideas list. 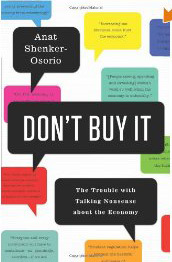 Do you need to be an economist to talk about the economy? At the “Pope is Dope” messaging session this year at Netroots, the panel was asked: What is the biggest mistake people make in conversations? 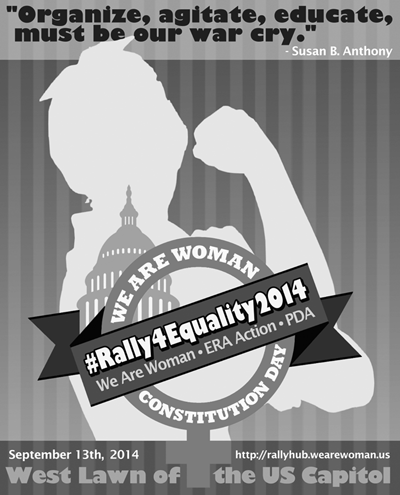 Some friends of mine are helping to put together the #Rally4Equality next week in Washington, D.C. They asked me if I’d ever written anything about equality. I’ve written about economic equality, I said. To be quite honest, the idea scared the crap out of me. Why? I typically write about economics and framing. What could I say about women’s rights that hasn’t been said by several generations of women activists and suffragist leaders? Of course I was also intrigued. What could I say? So I told them I’d think about it. One question that kept coming up: How would I explain women’s rights and equality to my conservative friends? Could I even talk about this issue with conservatives? Could I convince conservatives that equality was an issue worth fighting for? Below are my early attempts and what I learned. If you haven’t noticed yet, the conservative wedge issue for 2014 is going to be health care. 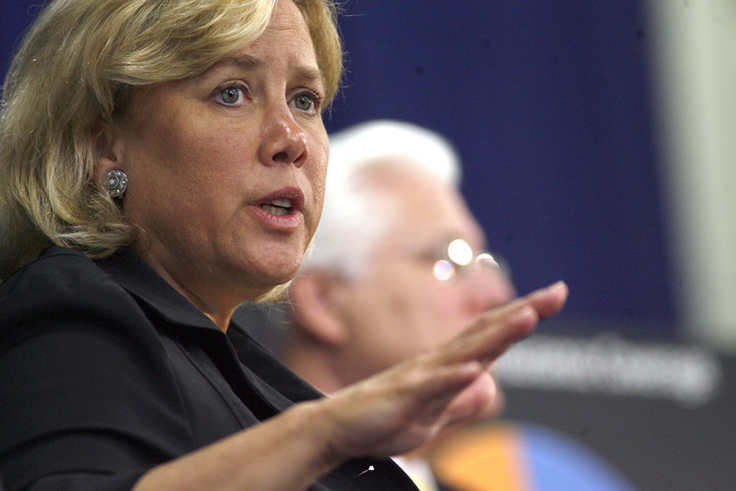 Democratic Senators like Mary Landrieu have noticed. They simply don’t appear to have much of a strategy to date: 1) apologize for the horrible website, 2) focus on the economy, and 3) keep explaining to conservatives why a conservative solution is not such a bad thing. If we can’t do better, well before November, expect to lose the Senate. In the aftermath of the shutdown publicity stunt, I’d like to take a moment for a friendly public service announcement. This morning, I’ve seen several examples online where we’re inadvertently reinforcing the conservative idea that Democrats “won’t negotiate”. Two of the most prominent are a) The New York Times “The Republican Surrender”, and b) the Rachel Maddow chart shown. I’m posting this PSA because I want to win people over, not “beat” them or force them to surrender. This feeds right in to the idiocy about Democrats not being willing to negotiate. Remember, the negotiation is still going to happen. Just like it was in April. If you want to perform a public service and help get rid of this lie, it’s easy. 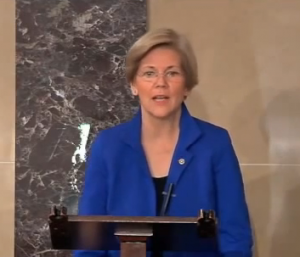 Perhaps the most important speech of the year: Elizabeth Warren on why government matters. By now, you’ve heard the Gingrich line about Obama being the “food stamp” President. That’s why I’ve said over and over again that this is the best food stamp President in American history. 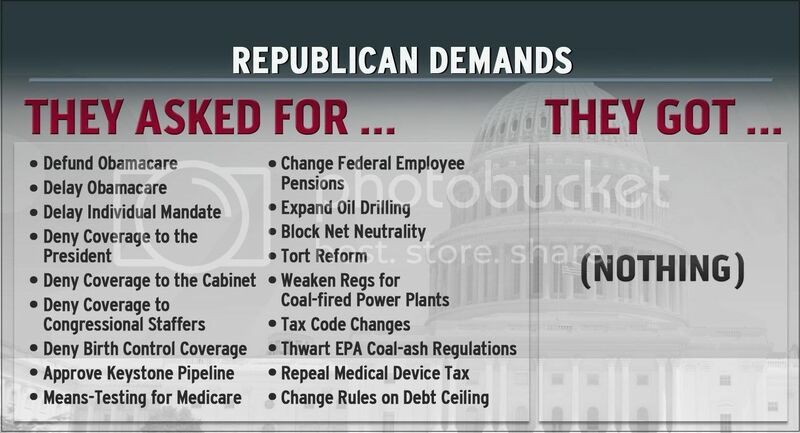 Here’s how Democrats responded and here’s how they should have responded.